Packing for a big move is a complex task and it should be separated into smaller steps to better distribute the workload. One of these steps is always the packing and moving of electronics and appliances. Any modern household has an abundance of these – from the microwave and the blender, to the TV and gaming console. Not only are these items the most delicate, they are usually the most expensive possessions to be moved and this is why they should be handled with extreme care. This article will lay out the basics to making sure that all of your precious equipment is properly packaged and secured, in order to avoid any damage or other problems during the move. It will also list out all of the materials you might need. Packing up electronics is a fairly simple job, provided you have a steady pair of hands (not necessarily your own) to do all the heavy lifting. There are just a few points to remember to make your life easier. The first thing is to always plan ahead. Do not throw away any of the packaging your hairdryer or gaming console comes in. The best way to pack away a piece of tech is the way it was originally packaged. This means holding on to the box, plastic bag and every piece of bubble wrap that your equipment comes in. Packing it as close to the way it looked when it arrived will ensure a minimal amount of movement and maximum safety for your item. The original packaging is always best, but failing that, resort to bubble wrap and Styrofoam. Always pack electronics in boxes where they would have a minimal amount of space to move and tumble. Fill any space that’s left with paper, bubble wrap, Styrofoam – any cheap material that will keep your precious positions from moving and hitting the walls on the way to your new home. 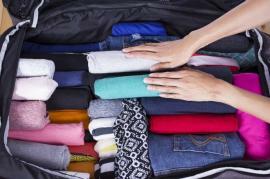 It is always best to pack one item at a time, instead of gathering things in one place and then packing them. This will ensure that you do not get any cables of small parts mixed up or lost in the packing process. Regarding cables, these are best coiled up and stored in small plastic bags in the box of the item they belong to. If, for whatever reason, you prefer storing any small parts, wires, cables, etc, together, it may be a good idea to label everything according to the appliance or device that it belongs to. This way everything can be easily sorted upon arrival. Another point to remember is to always take the batteries out of any item before transporting it. All of the batteries can be stored in a box, bag or other container until arrival. The important part is to prevent anything from falling out or getting lost along the way. Similarly, disassemble any item, composed of more than two parts. Even if it’s something small and durable, it is always better to spend the extra half hour assembling an item in your new location, than having it break on the way, because it wasn’t properly packaged. Because you might need to take apart certain items, it is always useful to have a toolbox handy when packing up, along with the standard set of packing tape, scissors, box cutters, boxes, bags, bubble wrap and Styrofoam. A tape measure might also come in handy. By following these steps and advice, you will be able to transport all of your equipment safely and without a hassle.